Boys Track- Nathan McBride of Vidalia, 100m- 10.63 & 200m- 22.33 @ Region 1-AA Meet. 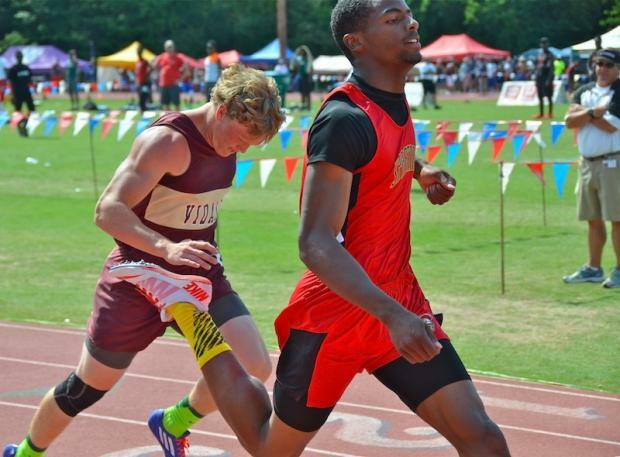 Boys Track- Braxton Lindley of Holy Innocents, 400m- 50.03 & 800m- 1:56.93 @ Region 6-AA Meet. Boys Field- Javian Williams of Early County, TJ- 48-00 & LJ- 23-5.50 @ Region 1-AA Meet. Boys Relay- Vidalia 4x100- 41.81 @ Region 2-AA Meet. Girls Track- Taylor DeLoach of Saint Vincent's, 100m- 11.82 & 200m- 24.72 (LJ- 19-6.50) @ Region 2-AA Meet. Girls Field- Kaylee Riley of Bremen, PV- 11-10 @ Region 7-AA. Girls Field- Morgan Carelock of Jeff Davis, HJ- 5-04 @ Region 2-AA. Girls Relay- Wesleyan 4x400- 4:01.14 @ Region 6-AA Meet.